For the second time in as many weeks, campaign signs for candidates in July’s general election have been destroyed by vandals supporting an opposing party. 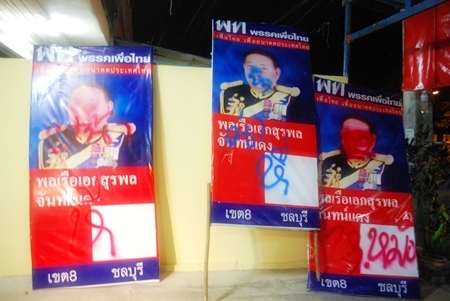 May 23 it was the Puea Thai Party’s turn to be on the receiving end of vandalism, with miscreants using red and blue spray paint to deface images on 20 signboards in Sattahip. The target was District 8 MP candidate Adm. Surapol Chandang and his signs along 15 kilometers of Sukhumvit Road between Marivit School in Sattahip and the Bang Saray junction. The election trail is heating up, and this time it was Puea Thai Party’s turn to be on the receiving end of vandalism. Surapot also claimed his wife received late-night telephone calls from someone spreading rumors about his personal life. He said he taped the calls and expects to find the caller soon. The sign damage comes a week after about 20 signboards for Democrat Party candidates were vandalized near the Ambassador City Hotel in Jomtien Beach. The incidents, combined with a shooting of an MP candidate in Bangkok, are more signs the upcoming electoral battle between Thailand’s warring red and yellow factions likely will be a tumultuous one. For his part, Surapol urged people not to vandalize his or anyone else’s election signs. “This fight should be fought over policy according to the rules and intelligence. There should not be an incident like this, because it is not the democratic way,” he said.